We investigate a concept for the construction a mobile Micro Optical ElectroMechanical Systems (MOEMS) based laser ultrasonic instrument to serve as a Micro Autonomous Ultrasonic Instrument (MAUI). 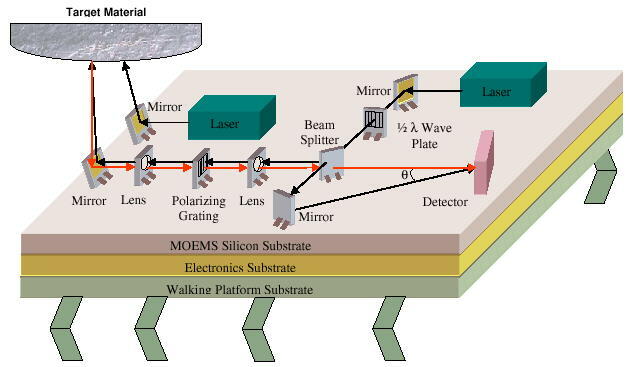 The system will consist of a laser ultrasonic instrument fabricated using Micro Electro-Mechanical Systems (MEMS) technology, and a MEMS based walking platform like those developed by Pister et al. at Berkeley. This small system will allow for automated remote Non-Destructive Evaluation (NDE) of aerospace vehicles. The growth of air traffic and the continuing operation of vehicles beyond the anticipated life cycle have exposed the need for more advanced Non-Destructive Evaluation (NDE) technologies for assuring the integrity of airframe structures, wiring, etc. Laser ultrasonic inspection instruments have demonstrated the ability to detect fatigue cracks and delaminations in structures . These systems can be used when the material under test has a rough surface, is moving relative to the detection system and even under high temperatures . However, laser based inspection instruments are generally too bulky to be used in the confined spaces that are of typical of today’s aerospace vehicles. Reducing the volume by a factor of 103 will enable increased inspection in areas that were previously inaccessible. This paper investigates a concept for constructing a mobile Micro Optical ElectroMechanical Systems MOEMS based laser ultrasonic system to serve as a Micro Autonomous Ultrasonic Instrument (MAUI). MAUI will enable rapid, remote, and automated NDE for vehicle health monitoring. MEMS technology is a direct outgrowth of Integrated Circuit (IC) fabrication techniques and is the key to miniaturizing this instrument. Alignment and bonding of laser diodes is an essential MEMS procedure for MAUI . Micro bonding and manipulation of objects the size of tens of microns is another necessary technique . To be autonomous; MAUI requires micro mechanical devices like the MEMS actuators and gears that have been developed at Sandia National Laboratories . Even micro robotic technology is necessary for some terrestrial applications of MAUI (walking or crawling systems) . The MAUI concept requires micro optical components such as lenses, mirrors, beam splitters, and phase shifters  that have been integrated onto free-space micro-optical benches . In operation, MAUI moves to the pre-selected inspection site and generates ultrasound waves in the target material using a laser (Figure 4). Fig. 4: Concept for a Micro Autonomous Ultrasonic Instrument (MAUI) (Size 1cm x 1cm). The waves are induced by rapid local heating that takes place in the material due to the laser pulse. A second laser beam interacts with induced ultrasonic waves creating a reflected beam that is ultrasonically modulated. The micro-optical components direct the reflected beam to a detector where the beam is combined with a reference beam to demodulate the ultrasonic signal . Material integrity is established by analysis of the received signals. Reducing the volume, cost and mass of instruments will enable swarms of theses devices to perform autonomous inspections of aircraft, spacecraft, terrestrial and space based structures. This capability will also facilitate the use of these instruments in swarms of hovering vehicles for internal and external evaluation of terrestrial aircraft. Micro instruments will lead to micro robots like MAUI that can crawl and walk to inspection sites and can remotely evaluate the interior of vehicles. See Figure 1 for an artist’s conception of various NDE agents evaluating an aerospace vehicle. Fig. 1: Artist’s conception of various NDE agents inspecting an aerospace vehicle. For the MAUI concept to become a reality, standard design methodologies will have to be used. One such methodology is parallel engineering. Dividing the effort into manageable components is often a successful strategy. Space projects are often divided into platforms (spacecraft) and instruments. When attention is paid to the design of the interfaces between the instrument and the platform integration problems are minimized. At Langley Research Center we are currently focusing our efforts on the design of the MEMS based Laser Ultrasonic instrument for MAUI. The MAUI platform will be developed in a follow on project. The platform consists of the mechanical frame, the means of locomotion, power storage and distribution, electronics, processing, and communications. By designing the platform with re-use in mind, it can be used for many applications and with many different types of instruments. The following issues will have to be dealt with regardless of the type of platform that is developed. Swarms of NDE agents are the likely outcome from reducing the size of current instruments into the micro meter realm and below. Micro agents may not have the same coverage area as current full size devices, but this limitation can be overcome by evaluating the structure with many identical devices in parallel. Another limitation that may arise from shrinking the size of instruments is that the volume constraints may prevent the agent from having multifunctional capability. This limitation can also be overcome by using teams of agents that are made up of a collection of single function agents that act in a coordinated fashion to perform various tasks. In both cases the use of swarms of micro agents can achieve full coverage. Power is the main concern of micro mobile systems. Current batteries do not have a sufficient energy density for systems this small. New technologies hold the promise of alleviating the problems. Fuel cells promise higher power densities than any current technology and can be engineered to run off of a variety of fuels . In a recent advancement fuel cells have been developed that can run off beer, wine or hard liquor . Another new technology involves radioactive decay to provide both motion of a cantilever beam and electrical power . This technology is the longest lasting power source, although it does not have as high a power density as fuel cells. Communication schemes must be low power and micro mobile systems require wireless communication for command and control as well as data handling. The two main communication schemes are RF and optical. Power is a concern, so both schemes have investigated passive systems instead of active systems. Both passive schemes rely on communication energy being delivered by external sources. For RF systems, RLC tank circuits, similar to RF id tags, can be used to absorb RF energy. In an optical system corner cubes are used for modulation of an external signal . Optical systems have been demonstrated over large distances. Pister et al has demonstrated a micro corner cube system that operated at l kbps communication link with across 150m . The communication network must be self organizing and adaptive. These self organizing networks are necessitated by the small amount of power available for communication. Data will have to be transmitted from peer to peer until it reaches its destination. Communication paths will change and have to be re-established. Biologically inspired schemes for communications are being used to create robust networks that reconfigure themselves to keep a communications link established . Ants and bees have been studied to give insights into how swarms of agents can maintain communications in an ever changing environment . All instruments will require some level of computational capability. However, power is of prime concern, so power consumption must be kept to a minimum. Processing may include instrument or data collection functions such as filtering, data transforms, and pattern recognition, data reduction techniques, and data encoding for communications. Other processing is necessary for command and control. This includes all command and control functions that are used in a centralized master or autonomous intelligence in distributed systems. Distributed systems may act alone or be used in a coordinated manner such as in swarms. It is entirely possible that accomplishment of NDE goals can only occur under the coordinated effort of many agents, thus intelligence and processing will be necessary at the agent level. Because both power and bandwidth are at a premium, it is unreasonable to assume that all of the raw data collected will be transmitted to a central node. Therefore processing to reduce the amount of data that needs to be transmitted will be necessary. To make processing easier to accomplish Berkeley has developed an operating system for their Smart Dust program called Tiny OS . Since the Tiny OS operating system is written specifically for small cooperative systems time will be reduced for applications development. MAUI requires extremely low power dissipation electronics. Low power electronics will reduce the requirements on the power storage system, thereby reducing the instrument mass, and decrease the instrument volume requirements by lowering the heat generated by the electronics. Low power electronics are also required to enable the computational processing and communications required of swarms of devices forming self-organizing networks. Low power electronics can be accomplished in several ways. As IC technology has advanced, the percentage of power dissipated in clock circuits has become prohibitive. Therefore, one method to reduce power relies on the development of asynchronous circuits. A significant portion of the power dissipated by IC circuits is due to the parasitics associated with bulk CMOS. Utilizing Silicon on Insulator (SOI) substrates significantly reduces these parasitics and therefore, lowers power consumption. Another candidate for low power electronics is CMOS Ultra Low-Power Radiation Tolerant (CULPRiT) technology from CAMBR . CULPRiT back biases the substrate to reduce the effective potential required to cause a transistor switch to change states. The reduction in voltage results in low power devices. If MAUI is to be utilized in space-based applications, low power radiation tolerant electronics must be available. Radiation tolerant versions of asynchronous logic (e.g. DOMINO) have been developed. The use of SOI substrates can also provide greater radiation tolerance. The use of CULPRiT provides radiation tolerance at the expense of increased die area. Fortunately, all of these techniques can be combined to yield electronics that are both extremely low power and radiation tolerant. Further research is required to determine the optimum configuration. Specific needs have been identified for processing, memory, and analog electronics. High speed processing will be necessary for command, control and data handling. These processing requirements will require large amounts of memory. Analog electronics will be needed to convert the signals from sensors and to handle power distribution. All of these electronics are required in low power radiation tolerant and extremely small form factors for micro-NDE applications. To integrate the electronic devices with power storage and MEMS components will necessitate flexible packaging options from bare die to packaged parts, hybrids and Multi-Chip Modules (MCMs). Environmental concerns will also play a large role in packaging of the devices. Locomotion is required in many ways and mediums. Micro walking robots of various types are being developed. These may provide platforms for remote interior inspection systems. Exterior inspection of vehicles like the aerospace plane can be accomplished by hovering NDE agents that can maneuver around the complete exterior. In a similar manner agents that can fly around in space can inspect and evaluate the International Space Station as well as other spacecraft on orbit. Mobility is a key function that is being addressed around the world by many groups and in many different ways. Multiple groups are working on micro walking robots. In Sweden, Ebefors has developed a multi-legged micro robot that can carry a load of 2500 mg . Another impressive micro robot from Berkeley is the “Solar Powered 10 mg Silicon Robot”, it has two legs and drags its body along behind it, but it is a true robotic system . It has built in electronics for control of the motion and solar cells for a power system, as well as MEMS legs and motors for locomotion. Micro robot technology is very promising and may one day lead to a platform for MAUI. For terrestrial NDE applications, a hovering vehicle would be sufficient for many of exterior inspections and evaluations. The requirements for this application are not as stringent as for the micro robots or micro satellites. However, this application can reap the benefits from those tight requirements. Reducing the volume, mass and power of an instrument will enable hovering NDE agents to stay aloft longer and possibly carry multiple instruments. To facilitate nano and pico-satellites groups are working on miniaturized thrusters. Some exotic designs use ions as the thrust mass while others are pursuing more conventional liquid fuels. The goal of Micro Aerospace Solutions (MAS) is to get mili-newton thrust levels from either hydrazine or hydrogen peroxide thrusters . These efforts will one day allow very small satellites to be as maneuverable as their full size predecessors. Space applications require a spacecraft as a platform. For micro-NDE applications this platform should be as small as possible. Towards that goal Aerospace Corporation has flown a set of ~250g Picosats . The satellites are roughly the size of a deck of cards and attached to one another by a tether. The demonstration flight was released from a converted Minuteman II rocket on January 26 2000 and communicated with a ground station while being tracked by the Space Surveillance Network . It is possible that future Pico sized satellites will be a space platform for MAUI. Ultrasonic waves can be created by using a laser that fires a short, intense pulse of light onto the material under evaluation. The ultrasonic waves are induced by rapid local heating that takes place in the material due to the laser pulse . It is these ultrasonic waves that are detected by the Laser Ultrasonic Receiver (LUR) system. A MOEMS based LUR system is comprised of a second laser and an optical system (Figure 4). The laser beam is reflected off a material in which ultrasonic waves have been created. The laser beam interacts with induced ultrasonic waves creating a reflected beam that is ultrasonically modulated. This reflected beam is directed by the micro-optical components to a photo-emf detector where the beam is combined with a reference beam to demodulate the ultrasonic signal . The reference beam is one of the two beams that are split by the beam splitter. The reference beam is passed to a mirror where it is redirected to the detector. This beam is necessary for demodulating the analog signal. The demodulation is accomplished by interference between the reference beam and the modulated beam . Fig. 2: Plot of the laser ultrasonic receiver signals; the reference beam (top), the reflected beam (middle), and the analog signal generated by the detector (bottom). At the detector both the reference beam and the modulated beam are summed to generate an analog signal. The photo-emf detector outputs a signal that is proportional to the amplitude and phase of the ultrasonic waves. Figure 2 is a plot of the reference beam (top trace), the reflected measurement beam (middle trace), and the analog signal generated by the detector (bottom.trace). All three traces are modeled as plane waves in the LUR system model. The detector signal clearly shows the initial ultrasound pulse created within the material. It also shows the second pulse that is reflected from the back side of the material or a discontinuity within the material. By analyzing the time of flight between the two pulses a determination can be made about the integrity of the material under test. The laser ultrasonic system can be implemented using free space micro optical bench technology like that developed by Wu et al . This technology allows for lenses, mirrors, beam splitters, and other optical components to be created using MEMS processes. MEMS techniques have even been developed for aligning and mounting the laser diodes into the system. The optical components needed for the laser ultrasonic system can all be fabricated using MEMS techniques. The devices will need latches and hinges so they can be assembled to create a free space micro optical bench. Although the techniques mentioned above work, the system is not robust. The tall thin structures are prone to thermal warping. Vibrations are another issue that plagues the design. Manual assembly takes too long and is prone to damage. There are promising technologies that may alleviate the problems outlined above. One such method is planar integrated free space optics . The by-product of fabricating planar devices on an optically transparent substrate is that thermal warping, and vibration issues are eliminated. Also, the planar devices use light paths that reflect from a mirrored bottom surface up to the optical elements. In addition, devices do not have to be assembled into the light path which zigzags between the elements and the reflective bottom of the substrate. See Figure 3 for an example of a planar integrated free space micro optical device. Fig. 3: Planar Integrate Free Space Micro Optics. An example of MAUI is shown in Figure 4. This example is based upon a laser ultrasonic system mentioned earlier that is implemented using standard MEMS micro optical bench techniques. The example shows a stack of substrates. 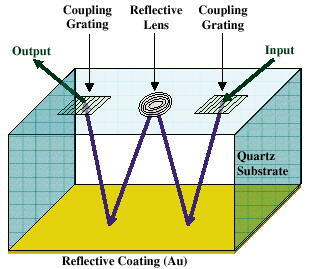 The top layer is the MOEMS substrate that contains the optical components for the laser ultrasonic instrument. The middle layer contains the electronics for both control of the instrument and control of the robotic functions. This is the level where power, communications and processing would reside. The bottom substrate is the micro robotic walking platform. Although the technologies are not mature enough to fabricate this device today, they are mature enough to begin a coordinated effort and prototyping that could lead to a MAUI type of NDE agent in the near future. If developed, MAUI could move to a pre-selected inspection site, and use a laser and ultrasonic waves to evaluate the interior of an aerospace vehicle. Material and structural integrity could be established by sending the MAUI crawling into very small spaces within wings, tails and rudders. Hopefully an agent like MAUI could be used in conjunction with hovering and flying agents to give complete inspection coverage of aerospace vehicles. The concept for a Micro Autonomous Ultrasonic Instrument (MAUI) for NDE evaluation of aerospace vehicles has been presented. This NDE agent could be developed in the near future. The goal of such a device is complete inspection coverage of aerospace vehicles. This device can only be developed using advances in technologies like low power, radiation tolerant electronics, and high density power storage like fuel cells. Robust MOEMS technology like Planar Integrated Free Space Optics is necessary due to the harsh environment that many aerospace vehicles operate in. By using a modular approach and parallel efforts for both the instrument and the platform for MAUI, the time will be reduced for development and micro NDE agents may become a reality in the near future. Scruby, C. B., Drain, L. E., Laser Ultrasonics: Techniques and Applications, (Adam Hilgar, Bristol, 1990). L. Y. Lin, S. S. Lee, K. S. J. Pister, and M. C. Wu, "Self-Aligned Hybrid Integration of Semiconductor Lasers with Micromachined Micro-Optics for Optoelectronic Packaging," Applied Physics Letters, Vol. 66, pp. 2946-2948, May 1995. E. Shimada, J.A. Thompson, J. Yan, R.J. Wood and R.S. Fearing, “Prototyping Millirobots using Dextrous Microassembly and Folding, Symposium on Microrobotics”, ASME Int. Mechanical Engineering Cong. and Exp., Nov. 5-10, 2000, Orlando, FL. M. C. Wu, L. Y. Lin, S. S. Lee, and C. R. King, "Integrated Devices Make an Optical Bench on a Chip" Laser Focus World, pp. 64-68, February 1996. S. J. Lee, S. W. Cha, Y. C. Liu, R. O'Hayre, F. B. Prinz, “High Power-Density Polymer-Electrolyte Fuel Cells by Microfabrication. In: Micro Power Sources”, K.Zaghib and S. Surampudi (eds. ), Proceedings Volume 2000-3, The Electrochemical Society Proceeding Series, Pennington, NJ, 2000. R. Colin Johnson, “Bio-Fuel Cell can run on Ethanol and Enzymes”, EE Times, Issue 1264, April 7, 2003, pp 45-46. R. Colin Johnson, “Microscopic battery runs sensors for decades”, EE Times, Issue 1223, Nov. 8, 2002, pp 53. Kahn, J.M. ; Katz, R.H.; Pister, K.S.J. "Emerging Challenges: Mobile Networking for Smart Dust", J. of Comm. and Networks, vol. 2, no. 3, September 2000. Thorbjצrn Ebefors, Johan U. Mattsson, Edvard Kהlvesten and Gצran Stemme, “A Walking Silicon Micro-robot”, Presented at the 10th Int. Conference on Solid-State Sensors and Actuators (TRANSDUCERS99), Sendai, Japan, June 7-10, 1999, pp. 1202-1205. Hollar, S; Flynn, A; Bellew, C.; Pister, K.S.J. "Solar Powered 10mg Silicon Robot," Micro Electro Mechanical Systems, MEMS-03 Kyoto. IEEE The 16th Annual International Conference on, January 19-23, 2003, pp. 706-711. Platt D., “A Monopropellant Milli-Newton Thruster System for Attitude Control of Nanosatellites”, 16th Annual USU Conference on Small Satellites, SSC02-VII-4, 2002.